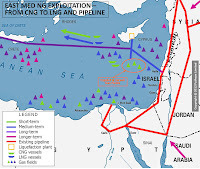 You are certainly aware that Nobel Energy from Texas recently discovered important natural gas reserves in the territorial waters of first Israel and later Greek Cyprus. 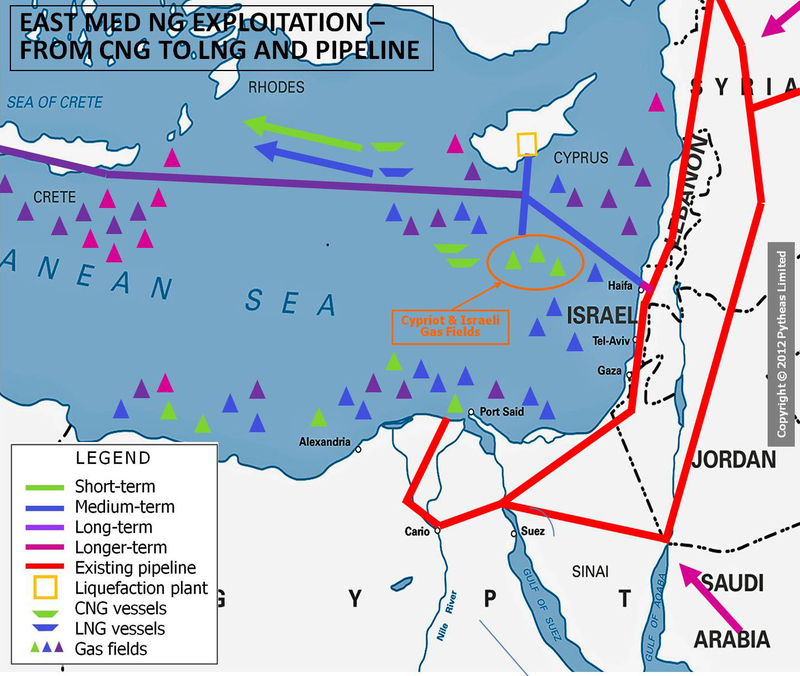 The Israeli gas has already started flowing into the Jewish state, and the Greek gas is expected to be ready within a few years. While these discoveries were being made, a breakdown occurred between Turkey and Israel over the May 2010 Mavi Marmara incident in which eight Turks and one Turkish-American were killed in an Israeli raid. The worsening of relations between the two countries, considered to be strategic allies in the past, pushed the Jewish state to sign economic cooperation and defense agreements with Greek Cyprus. Moreover, the Greek Cypriot economy recently collapsed due to the failure of its hypertrophied banking system, the main source of income for the island. Last but not least, Israeli Prime Minister Benjamin Netanyahu offered an apology to the Turkish people aiming to restore relations between the two countries. These dizzying developments have produced a new geostrategic game in the Middle East. The economic features, as well as the political ones, of this game are mutually interfering, pulling the main players like Turkey, Israel, Greek Cyprus and the EU, and not to forget Nobel Energy, into a new order. The fate of this new order will depend on many factors, such as developments in the Israeli-Palestinian and Cyprus conflicts, the nature of the new regime in Syria and the course of the economic problems the main players are facing. The Greek Cypriot gas reserves, of which Nobel Energy has a 36 percent share, hold trillions of cubic meters, surpassing local needs for 100 years. The Texan firm, quite naturally, would like to produce the maximum amount and as soon as possible. This goal is obviously shared by Greek Cyprus. In a recent article published by the Robert Schuman Foundation, French economist Sebastien Richard asserted that the Greek Cypriot economy can no longer count on revenue from the finance sector and that it can only get out of the debt trap by exporting gas to Europe. He adds that an independent study made in 2009 shows that the unification of the island would contribute to economic growth of 3 percent for five years. When it comes to Israel, it is not as simple as it is in the case of Greek Cyprus and Nobel Energy. Tülin Daloğlu from Al-Monitor expressed in a recent article the Netanyahu government's point of view about the gas issue. I quote, “They highlight two points: Israel has not yet decided whether it will export any of the gas, and if so, how much, and Israel takes the issue of safety seriously, noting that any pipeline between Turkey and Israel must cross through the territorial waters of Lebanon and Syria.” I will come back to the safety issue, but let's first explain the hesitations of Israel regarding gas exports. I don't know if readers have heard of the “Dutch disease.” When natural gas reserves were discovered in Holland in the 1960s, a strong appreciation of the Dutch guilder followed, eroding the competitiveness of Dutch industry, the pillar of this export-led-growth country. Since then, this adverse effect was termed the “Dutch disease” in economic literature. The case of Israel, an export-led-growth country, is quite similar to the Dutch case in the 1960s. Let me add that the Israeli shekel has already appreciated against hard currencies in recent years, so Israel is not in a hurry. However, the EU is in a hurry. It has quadruple interests in this gas game: First, the Cypriot gas can save the island's economy and repay the billons of euros lent by the EU. Second, it can alleviate Europe's energy dependence on Russia. Third, it can be used as leverage to push Greek Cypriot President Nicos Anastasiades into a constructive attitude during negotiations with the Turkish Republic of Northern Cyprus (KKTC). And finally, a serious peace process, if it happens, will remove the main thorn in the membership negotiations between Turkey and the EU.